How Do I Use a Safety Plan? Safety plans may help you anticipate the dangers you may face. Just as abusers continually shift their tactics of power and control, your safety plan is an adaptable tool to help increase your safety in your ever-changing situation. Click on a heading to expand that topic. 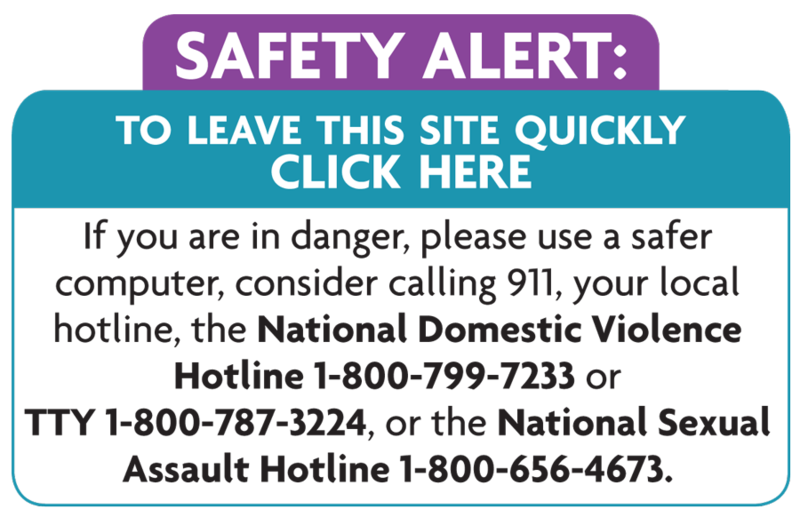 Safety plans can be made for a variety of situations: for dealing with an emergency, such as when you are threatened with a physical assault or an assault has occurred; for continuing to live with or to date a partner who has been abusive; or for protecting yourself after you have ended a relationship with an abusive partner. If you are a woman who has been abused, you probably know more about safety planning and risk assessment than you might realize. Being in a relationship with an abusive-and surviving-requires considerable skill and resourcefulness. Any time you do or say something as a way to protect yourself or your children, you are assessing risk and enacting a safety plan. You do it all the time; it’s just not always a conscious process. It can be a helpful safety strategy to evaluate risks and make safety plans in a more intentional way. Whether you are currently with your partner or have ended the relationship and whether you choose to use available services or to involve the police, there are certain things that are helpful to consider in planning for your future safety. If you are planning to leave your partner or already have left, be aware that batterers often escalate their violence during times of separation, increasing your risk for harm, including serious and life-threatening injury. Making a separation safety plan can help reduce the risks to you and your children. Only you can judge who it’s safe to tell about your situation and who to ask for help. Sometimes, people who don’t have good information about domestic violence respond to women who have been abused in ways that aren’t helpful, even when they mean well. On the other hand, you might feel comfortable asking for help from someone you know. It’s your decision. The important thing is for you to identify all the people who might be willing and able to help you. Make a list of their phone numbers and attach it to your safety plan for easy reference. You don’t have to wait for an emergency to ask for help. In fact, it’s a good idea to talk to people who can help before there’s a crisis. Find out what they are willing and able to do for you. That way, you’ll know in advance if you have a place to stay, a source of financial assistance or a safe person to keep copies of important papers.